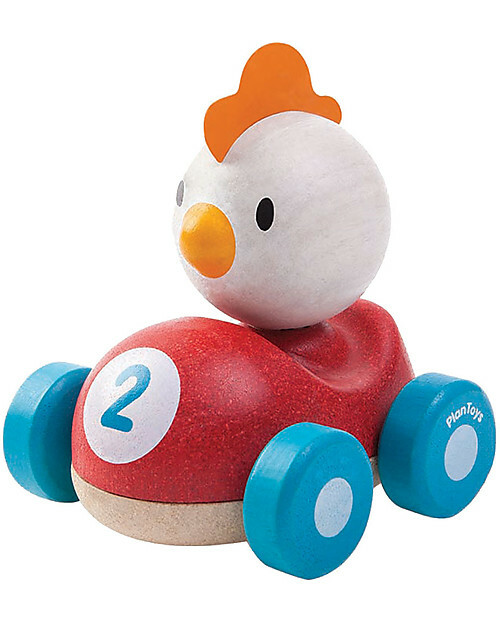 Wooden Chicken Racer, 11 cm - Eco-friendly fun! Signed by the 100% green brand PlanToys, this racing car is a classic toy with a twist: it is eco-friendly and safe both for the people and the planet! And it's driven by a crazy little chicken! Its curious, rounded shape makes it suitable for even the smallest hands! It is designed to enhance imagination and coordination. The whole range includes various vehicles to chose from! 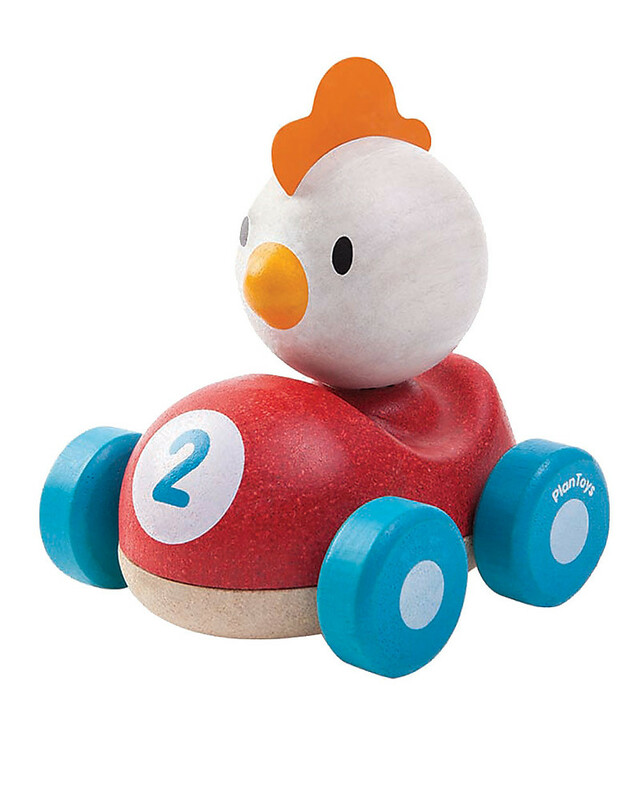 Like all PlanToys items, this toy is made of rubberwood, a by-product of the latex industry and it is thereferore extremely sustainable. Because it is never too early to learn the importance of taking care of the environment! Founded in Thailand in 1981, PlanToys is now worldwide known thanks to its special attention to ecology! All PlanToys items are made of rubberwood, a sustainable by-product of the latex industry: it uses the trees when their productivity declines. It is an extremely responsible and eco-friendly production system. All PlanToys items are safe both for the people and the planet: they come in recycled packagings, use water-based colours, and non-formaldehyde glues. All these toys comply with EU and US safety standards. PlanToys items are designed to enhance the psychomotor development of our children while teaching them the importance of caring for the planet. PlanToys are particularly keen on the design of their toys. Inspired by the traditional wooden toys, all PlanToys items get a modern twist while maintaining the classic colours and fun and have won several Red Dot Design Awards. Material: solid rubber wood. All toys from this brand are made with a sustainable by-product of the latex industry’s harvesting of trees used for natural rubber production once their productivity declines. This makes these toys completely sustainable and environmentally responsible. Wood is also a completely biodegradable material. Colours: water-based dyes and organic pigments of plant origin, eco-friendly and safe both for the people and the environment. Free from lead or heavy metals. Made in Thailand respecting the environment and the workers. PlanToys initiated a work-generating plan to increase living standards of local people. They provide opportunities for those with disabilities to work in the company.